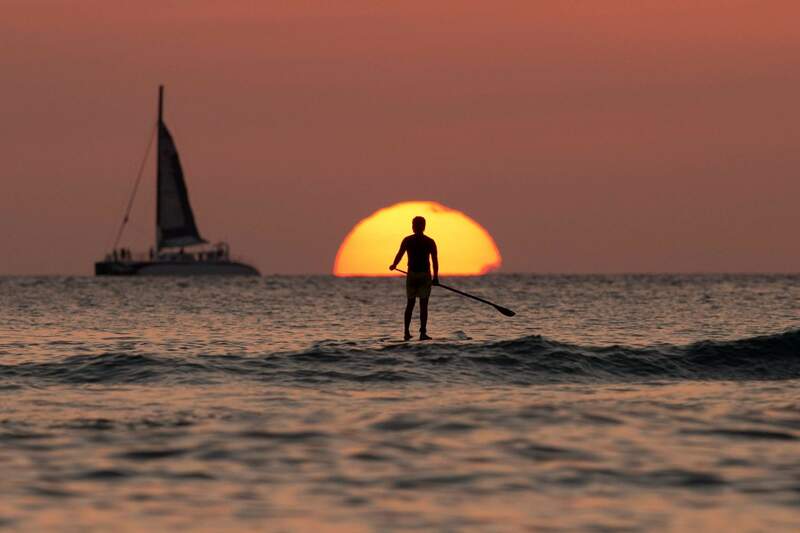 A paddleboarder looks our over the Pacific Ocean as the sun sets off of Waikiki Beach, in Honolulu. With the right moves, you can budget for travel without going into the red. When you’re just starting out, even a weeklong vacation might seem like a one-way ticket to credit card debt – especially if you have a modest income or lack access to paid time off. But with the right moves, you can budget for travel without going into the red. Start savingFor Krista Aoki, the key to avoiding debt while traveling is simple: Save. Decide where to minimize costsThe best vacation isn’t necessarily the most expensive vacation. By aggressively reducing your basic costs – flights, transportation, lodging, food – you might be able to squeeze in more exploring for a smaller price. Use credit card rewardsWhen Leah Gervais was 24, she traveled in Southeast Asia for four months without going into debt, in part by using credit card rewards to pay for her flights. Make money while travelingBoth Aoki and Gervais have something in common: They work while they travel. That gives them flexibility to visit more places and stay on the road longer. “I started doing some freelance writing work while I was (in Southeast Asia),” Gervais says of her four-month trip, noting that the cost of living in Cambodia was significantly lower than it is in Manhattan, where she lives. On that trip, she also worked as a bartender for a short time. Because she was traveling frugally, her income from these jobs was enough to support her abroad. NerdWallet: How to save for vacation: https://nerd.me/2E8l4BW.Krista Aoki: 8 simple ways to save and make money in your 20s: https://bit.ly/2C67o7I. Urban 20 Something: How to travel internationally for $50: https://bit.ly/2Oe7pxy.